It’s true when we say that, all things considered, nothing about addiction — or the road to recovery — is easy. Though everyone in life has an individual journey characterized by our own individual experiences, there are also common themes and shared dynamics with one another. When it comes to something as frustrating and difficult as recovery from various addictions, unfortunately, emotions like guilt and shame tend to surface. What’s even tougher to deal with is that, typically, these emotions can’t be shaken off easily. Ultimately, the low self-esteem brought about by feelings of guilt and shame results in a lack of self-love. When it’s hard to accept and love yourself for who you are — regardless of who you were — this makes the path to total recovery addiction seem nearly impossible. Simply put, the truth is that learning how to love yourself again is key to successfully living a renewed life. Taking a personalized, guilt-free and judgment-free approach to drug rehabilitation, Front Range Clinic isn’t here to dwell on your past. Instead, our main focus is about working towards a brighter future. As Northern Colorado’s leading outpatient rehabilitation and medication-assisted treatment (MAT) facility, Front Range Clinic uses evidence-based, scientific treatment plans designed to help individuals overcome drug addiction. If you’re seeking a kind, caring environment that will help you in your journey toward recovery from drug addiction, look no further than those who recognize and understand the challenging experiences that you’ve undergone. Through values like understanding, love, and an uplifting attitude that embraces the importance of self-love, Front Range Clinic is here so that you don’t have to fight your addiction battles alone. Let us help. 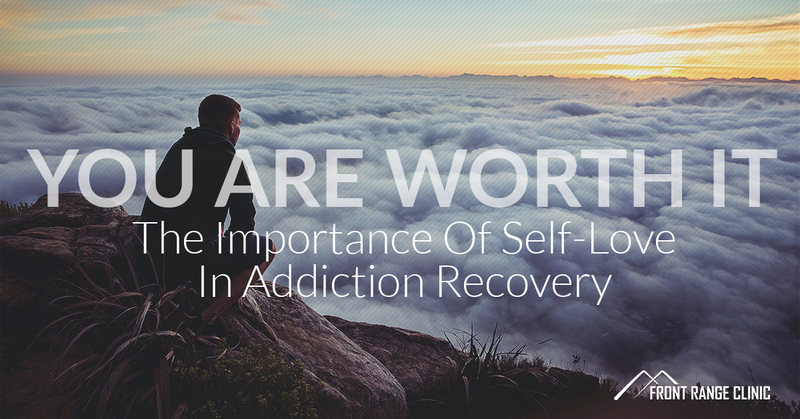 Read more below about the importance of self-love as it relates to addiction recovery, and feel free to reach out to us whenever you’d like if you’d care to know more about our addiction recovery services. Even though you may think that your past actions suggest otherwise, it’s important to recognize the fact that, innately, human beings are good. It’s true — regardless of what you think, just take a moment and accept that you are a good person. The power of this inner-acceptance will be a very useful tool in your road to addiction recovery. Not only will you feel good about yourself, but you’ll also be working to help reshape the image that others have of you. Ultimately, everybody deserves a fair chance to be a good person regardless of their past behavior. Though this is easier said than done, reaching out and getting in touch with the ones that you may have affected during your addiction phase is well worth your time. Bear in mind that not every individual will be willing to make amends or accept your apologies, but over time, they can eventually come to forgive you. Setting the record straight and genuinely explaining yourself to these individuals will not only take weight off of your guilt conscience, but doing your best to make amends with others is a key aspect in reshaping other people’s perceptions of you. No matter who you are or what your life situation is, our addiction recovery specialists cannot underemphasize the importance of simply taking care of your physical health. Many of those struggling with the grips of addiction don’t have the resources or the foresight to take proper care of their physical health, leading to a number of health complications down the road. These health complications may or may not warrant medical intervention at a certain point. As a reflection of the new-and-forever-improved you, it only makes sense to treat your body as well as you’ve now decided to treat your mind. This means that you should exercise multiple days a week, eat a healthy diet full of fruits, vegetables, lean protein and whole grains, and occupy your mind by working, reading, or doing whatever you can to learn. In addition to taking care of your physical and mental health, focusing on self-love is also a great time in your life to consider trying something new. Perhaps there’s a certain language that you’ve always wanted to learn, somewhere exciting that you’ve wanted to visit, or maybe you want to give your culinary skills a shot by taking a cooking class. Mindfulness meditation is also a worthwhile way to spend your time and listen to yourself. As long as you’re occupying your time in a wholesome and productive manner, then go for it! Even an afternoon spent at the Denver Zoo or attending your first Rockies game can lead to some unexpected insights. Follow your heart and do something that you enjoy, and you’ll experience the personal growth that you deserve. Always Remember This: You Are Worth It! Plain and simple, no matter what you’ve done or struggled with in the past (or even right now), just know that you absolutely deserve to have a healthy, happy, and a fulfilling life. By loving yourself, you can love others and enjoy a life that you truly enjoy living. With our addiction recovery services in Fort Collins, Greeley, Loveland and other convenient locations in the front range, Front Range Clinic will help lead you to a new life. Get started today.